Sapper Bradnam – formerly Junior Soldier Bradnam – describes the transition from Phase 1 to Phase 2 training, as he begins to learn the trade of a Royal Engineer at the Royal School of Military Engineering (RSME) at Chatham in Kent. Basic Construction Techniques (BCT) covers various things, from setting up formwork and concreting to learning how to tie basic knots. Every day, new information was fed to us and we were expected to learn very fast. The “best books” [notebooks] that we had were an excellent way of helping us absorb this information. After all the elements of basic construction had been taught, we had our first modular test. There was a theory paper and 3 different practical tests that had to be completed in order to pass. The 3 practical tests included setting out a 2-metre squared formwork, tying basic knots and creating a square lashing, and setting up and using a Makita drill. 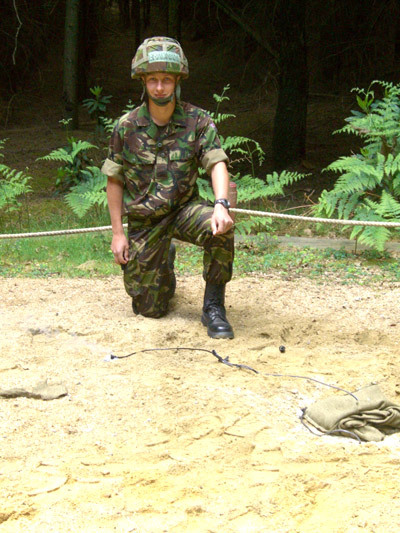 Safety on the drill was a main focus, however all the tests were just as difficult. Not everyone passed the test first time – some had re-sit. Once the basic construction module had been completed the next module we started was Water Supply. This module covered everything that enables us to source, pump, purify and store water. We built a cuplock tower (water tower), set up a small groups water purification unit, NBC purification units and APE (Purification Equipment). Water supply is one of the main roles that Royal Engineers undertake in Afghanistan and it is therefore a very important subject. The module was slightly shorter than BCT however there were a lot of facts and figures that needed to be learnt in order to pass the test. Again the test comprised a theory paper and 3 practical assessments which included using a gilkes pump, using the APE unit and naming component parts from various pieces of equipment. The pass rate was a lot higher than that of BCT, which I think was down to people understanding the standard required to pass the test and how much work and revision was needed. On top of all the Combat Engineering we had learnt we also continued to complete physical training, which, in keeping with the rest of the course, is a lot harder and more demanding. In the first week alone we had a personal fitness assessment, military swim test, 4-mile run and a 5-mile loaded march (tab). After 2 weeks of leave this amount of PT was hard work, but everyone pushed on and worked hard and actually did OK on the sessions and tests. The start of this course has been a real eye-opener into the standards expected in the Royal Engineers and in the rest of the Army. It is a lot harder than Phase 1 and what I expected. That said, I am enjoying rising to the mark and can’t wait to carry on with the rest of the course. Next week is Demolitions week, which has a reputation of being one of the best weeks in the course. I cannot wait!